This article is about the French word. For the municipality in Prince Edward Island, see Crapaud, Prince Edward Island. Crapaud is sometimes used as an incorrect reference to the Fleur-de-lys on the ancient heraldic flag of the kings of France. The three fleurs-de-lys were sometimes misinterpreted as "three toads erect, saltant", instead of "three lily flowers". The word crapaud is used extensively by fictional British soldier Richard Sharpe as a derogatory term for the French in Bernard Cornwell's novels set during the Napoleonic Wars. Jean Crapaud, also Johnny Crappeau or Johnny Crappo, as defined by Webster's Online Dictionary, "is a jocose name given to a Frenchman. It is intended as a national personification of the French people as a whole in much the same sense as John Bull is to the English. It is sometimes used as a literary device to refer to a typical Frenchman, usually in the form of Monsieur Jean Crapaud." The usage of the word "crapaud" in this case is similar to the derogative use of the word "frog", referencing the supposed French affinity for frog legs as a delicacy, and thus considered to be a slur and derogative. The name Crapaud is used in the Channel Islands to describe a person from Jersey in a derogatory way, the name meaning toad in the local Patois languages, including Jèrriais and Guernésiais. Toads live in Jersey but not on the other islands. The "tempter" (he holds the forbidden fruit; hidden in his back are toads and reptiles, symbolising corruption) and the foolish virgins (their lamps are overturned, symbolising their emptiness; they hold the scrolls of the law closed, thus remaining ignorant of the Lord's will). A mediaeval interpretation of the Parable of the Ten Virgins from the Gospel of Matthew 25:1-13. 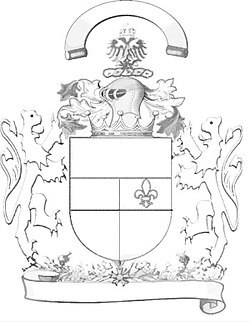 Blason Pharamon: Sable three golden toads. ^ Ebenezer Cobham Brewer (2001). The Wordsworth Dictionary of Phrase and Fable. pp. 438–439. ISBN 1840223103. Fleur-de-lis, -lys, or -luce (Fr. lily-flower), which is the name of several varieties of iris, and also of the heractic lily, which is here shown and which was borne as a charge on the old French royal coat-of-arms. In the reign of Louis VII (1137–80) the national standard was thickly charged with flowers. In 1365 the number was reduced by Charles VI to three (the mystical church number). Guillim, in his Display of Heraldrie, 1611, says the device is "Three toads erect, saltant". ^ Ellen J. Millington. Heraldry in history, poetry, and romance. Chapman and Hall; 1858 [cited 27 September 2012]. p. 8–. ^ Jean Crapaud. Webster's Online Dictionary. Retrieved 26 September 2012. ^ "Jersey toad is unique species, say experts". BBC. James Edwards (Professor.). John Bull, Uncle Sam and Johnny Crapaud. Henry G. Little; 1888. James Edwards. John Bull, Uncle Sam and Johnny Crapaud. BiblioBazaar; February 2010. ISBN 978-1-144-02435-0. Mary Alice Fontenot. Clovis Crawfish and the Curious Crapaud. Pelican Publishing; 1 November 1986. ISBN 978-0-88289-610-6.